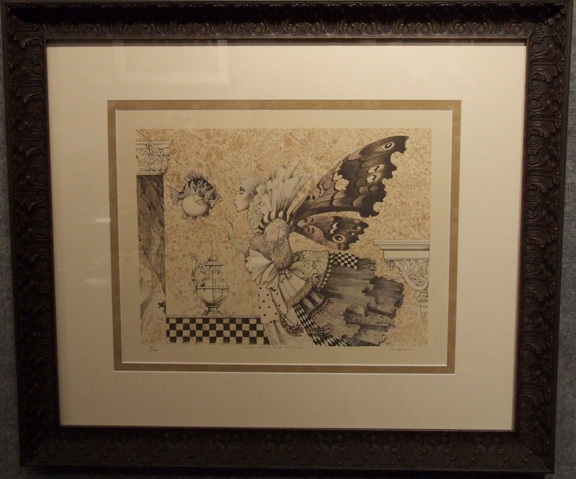 From the Magic Fish Studio, the home of James Christensen, comes this sophisticated yet whimsical piece of fine art. It sprang to life as an unfinished verse in the artist’s sketchbook: "When Faeries talk with Fishes, both express their wishes/ When Fishes talk to Faeries, the conversation varies..."
Soon a drawing appeared above the unfinished lines of the poem. The magic of the initial muse carried over into the decision to create the work as an original stone lithograph. It is a stone lithograph because James actually drew the image on a 300 lb. limestone. This is all the more impressive considering the image is created in reverse onto the stone. The image is transferred from the stone onto a sheet of fine watercolor paper by hand on a lithographic press. The final stone lithograph is considered original because this image does not exist as we see it until the lithograph is produced. Hand-tinting original stone lithographs predates color printing. That the color work on each is added by hand enhances the concept of each being an original; no two are exactly alike.